Brush bottom of glass baking dish with 2 tablespoons of the butter. Spread nuts in teh baking dish. Set aside. In a small pan, melt sugar over low heat. Stir constantly with a wooden spoon. When sugar starts to caramelize, continue stirring to deep it from burning. When the sugar melts completely and turns a golden brown, add a pinch of baking soda and stir. Add ramaining butter and stir well. Remove from heat and pour at once over chopped nuts. 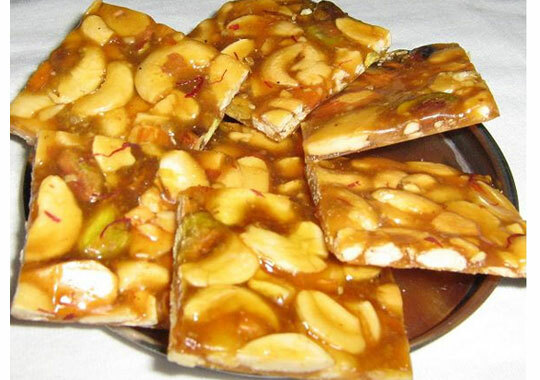 Working quickly before it starts to harden, spread caramel evenly over the nuts. Use a heatproof spatula or wooden spoon greased with butter to pat nuts and caramelized sugar together. Cool. When caramel hardens cut itno servign pieces. When cool, stor eat once in an airtight container. End.